You thought you’d be the happiest person in the world when you had a baby, one of the most important and awaited events in your life. You fantasised about this moment since you got married, or maybe even since your teenage years? So why are you so down and upset often? You are not alone! More than eighty percent women suffer mood disturbances after pregnancy ("postpartum"). Feeling disturbed, isolated, fearful, or even unloving toward your baby sometimes, and severe guilt for going through these feelings is not unusual. Often the symptoms are mild and melt away with the preoccupation of bringing up baby! But in many cases it turns into a disabling mood disorder known as Postpartum depression or ‘baby blues’ –a transient state of heightened emotions after recently giving birth. Symptoms typically include downcast mood, tearfulness, inability to enjoy pleasurable activities, troubled sleep, fatigue, appetite problems, suicidal thoughts, feeling an inadequacy as a parent and impaired concentration. 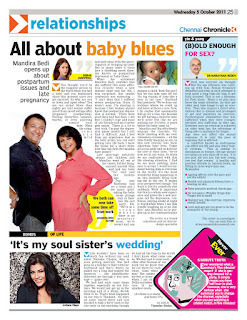 Late marriage naturally means late children, and Mandira went all out at her career, did her thing to her heart’s content, enjoyed marital bliss and had her baby ‘Vir’ only just two months ago. Brave move according to many conventionalists? But then Madonna had set a trend and I’m seeing many ‘girls’ taking the baby boom plunge only in their late thirties and early forties. Mandira and Raj effortlessly manage the cherubic Vir while chatting with me over cimamon croissants- all the time fondly keeping an eye on this new entrant into their otherwise busy lives. Today all is put aside and on hold for the love of their lives, “we’re now set in our ways. So when we are confronted with this life altering situation, I find we are more yielding, more easy to accept. I would recommend having kids to everyone in the world. It’s the most wonderful thing happening to us, this fantastic being looking me in the eye. It makes your perspectives change. You want to live for somebody else suddenly. Work is important but this is a whole new experience and gives life a new purpose. All the depression, confusion, staying awake at night is worthwhile when I see this bundle laughing up at me like this” says Mandira as he gurgles up at her rambunctiously. 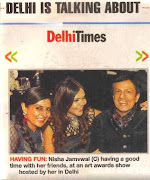 Nisha great article, about something that people cower to discuss and bring out. That she spoke about it so candidly -kudos to her. can be tough on the best of us but no one ever admits to depression in this phase.